WrestleMania 35 Is Reportedly The Second Highest-Grossing Event In WWE History - Wrestling Inc.
WrestleMania 35 host Alexa Bliss appeared in a segment at Sunday's pay-per-view from MetLife Stadium in East Rutherford, NJ to announce a sold out crowd of 82,265 fans in attendance. WWE also announced that the event grossed $16.9 million, surpassing the stadium's previous record of $12.3 million set by WrestleMania 29 in 2013. WWE also announced that WrestleMania 35 was the second highest-grossing event in WWE history, only behind WrestleMania 32 at AT&T Stadium in Texas. 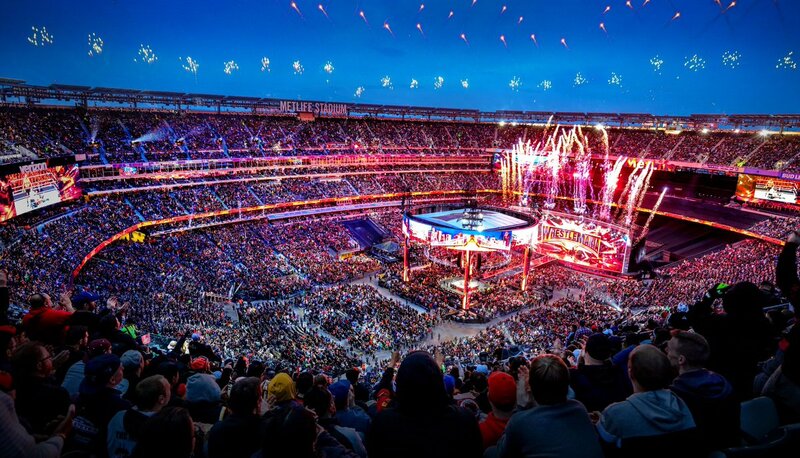 EAST RUTHERFORD, NJ – April 7, 2019 – WWE® (NYSE: WWE) announced tonight that WrestleMania 35 broke the record for MetLife Stadium's highest-grossing entertainment event. WWE's annual pop-culture extravaganza grossed $16.9 million, surpassing the venue's previous record of $12.3 million set by WrestleMania 29 in 2013 as a sold-out crowd of 82,265 fans from all 50 states and 68 countries converged on MetLife Stadium. "WWE outdid themselves by creating an even more exciting WrestleMania than we experienced six years ago," said New Jersey Governor Phil Murphy. "The WWE Universe helped deliver significant economic results to New Jersey, and we look forward to the opportunity of hosting WrestleMania again in the future." "We are thrilled that WrestleMania's return to WWE's 'front yard' delivered incredible results," said WWE Executive Vice President of Special Events John Saboor. "This would not have been possible without the tireless support of Governor Murphy and our public and private sector partners throughout the New York and New Jersey region. We now turn our attention to next year, where WrestleMania will make a historic Tampa Bay debut."